Not long ago, people used to squeeze real cupcakes in times of stress or tension. It was a messy and costly affair as many high-ranking officials and upper management types could easily squeeze a dozen cupcakes before lunch. But times have changed and now savvy business people rely on one of these Stress Cupcakes to help them through a trying day. Each cupcake is 3-1/4" (8.3 cm) tall and made of soft foam rubber. Net bag with illustrated header. 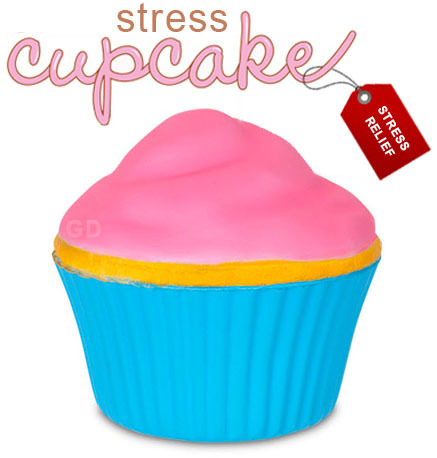 Cupcake Stress Squish, Squeeze & Squash Your Stress Away! Not long ago, people used to squeeze real cupcakes in times of stress or tension. It was a messy and costly affair as many high-ranking officials and upper management types could easily squeeze a dozen cupcakes before lunch. But times have changed and now savvy business people rely on one of these Stress Cupcakes to help them through a trying day. Each cupcake is 3-1/4" (8.3 cm) tall and made of soft foam rubber. Net bag with illustrated header.